Save 25% by buying this bundle! 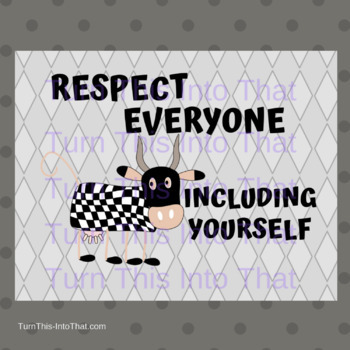 These cute Cow themed classroom rules posters are ideal for reinforcing positive behaviors in the classroom and establishing a positive classroom environment - all with the help of adorable cows! 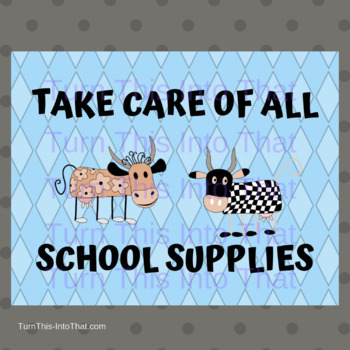 This bundle is great if you want to color mix and match the posters or if you want to use one color this year and another the next year. 33 Posters are included in this set with gray, green and blue backgrounds - 11 of each color. 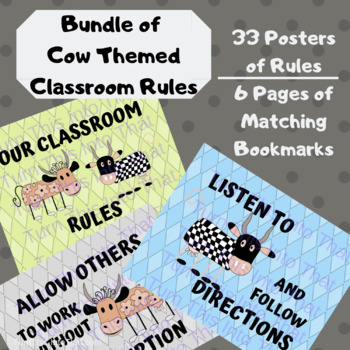 I've also included 2 pages of matching bookmarks per color set- some that have the rules listed with cow images and some that are simply cow images. Each bookmark measures approx. 6 1/2" x 2 1/2". Zip file containing both pdf and png formats. My watermark will not appear on your downloads. Would you like a different color to match your classroom environment? Contact me before purchasing and I can work with you to customize the color theme.